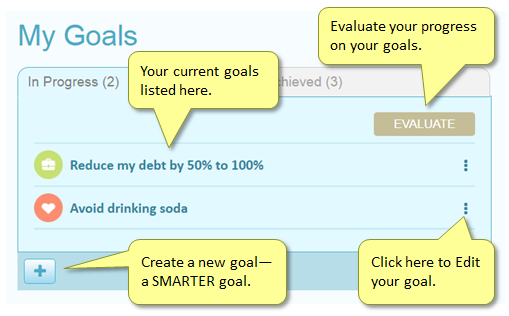 Goal Achiever™ lets you create SMARTER goals–the kind that skyrocket the likelihood that you’ll achieve them. Goal Wizard – Use this the first few times you create a goal. It steps you through and teaches along the way. You launch the wizard from Goal Achiever™ using the button at bottom right. If you are new to the principles and theory behind SMARTER goals, you should go here and watch the video. Quick Add form – Use a single page input form after you understand what goes into a SMARTER goal. You open this form by clicking the + button at bottom left, in Goal Achiever™. B) How you did (performance) on the Intensity and Duration of each activity for that day (numeric value).